clear, articulate and engaging mirange, smooth highs, tubelike. Can listen for hours with no fatigue. not the deepest tightest bass... there's bigger Blue Circles for that. First impression on lifting this amp onto my equipment rack: there's no way it can weigh only 30 pounds! Feels as heavy as my old 4B-ST which was supposed to weigh 42 pounds. First impression on playing music: Wow! big soundstage and the highs are SO smooth! Overall it's more laidback than the 4B-ST so it draws you into the music instead of shoving it into your face. Bass has nice bloom. Very good PRaT - the music ALWAYS gets my head bobbing and feet tapping but unlike Naim amps, soundstage and imaging are also impressive! Musicality, Detail, Vocal presentation. Maintains the wholeness of music. Cool running. After auditioning several amps, I decided on the BC22. Although I used it with other preamps, my comments are mostly from my experience with the BC22 mated to the BC21.1 preamp. The two definetely form a immensely musical system. The bass reaches deep (although I uspect is slightly elevated), the midbass is absolutely lush, the midrange is as accurate as I can recall ever hearing- my references are Joan Baez and Emmyolu Harris live with no amplification- As a matter of fact I find that the BC system serves the voice better than anything I ever heard. The treble is clear, extended, and non fatiguing. One way to describe the sound is to say that it is very detailed and accurate, yet it does not throw you all that detail at you, it rather lets you discern, at your leasure, all the music you can find. I drive Magnepans 1.6QR with the BC22 and the combination is magical. Its only shortcomings are on very loud passages when tha amp will rather politely compress the bass lines..
Bass doesn''t go very deep like my Bryston 4BST. This is so far the best sounding solid state amp that I ever had, very musical and very sweet to my ears it makes me want to listen for hours without fatigue, not boring at all. Bryston, YBA, Musical Fidelity A3cr, Muse160. Absolutly musical, ability to render nuance, emotional, beutiful midrange clarity, high build quality. Bass is not absolutely "slamming". Certainly not real weakness, just a fact. Let me start of by stating that the Blue Circle BC22 is just an all around satisfying product. I won't go into alot of technical talk, but I will discuss how this fine product has impacted me. First off, let me tell you that the reason I wanted to purchase this amp was because of the tremendous experience I have had with other Blue Circle products. I picked up a Blue Circle BC21 preamp about 8 months ago and it just absolutely blew me away (refer to my summary on Audioreview). Anyway, when I received it I was impressed first by the attention to packing materials. I first pulled out the hefty little, yes the BC22 is modest in size, but hefty none-the-less (about 36 lbs!) and began the break in process. Now, about 3 weeks later I began serious evaluation. The naturalness of the midrange is what I first took notice of. Voices sound sweet and quite palpable and insruments sound very clear and accurate. Soundstage depth is large and images are very stable. Seperation is very good and placement is accurate. I must say this, the BC22 really does not come through as an amp with any real in your face strenghts or weaknesses. It just does music very accurately and naturally. I really had a hard time trying to pick at its sonic presentation without getting lost in the music. After a few more months the little BC22 sounds even less like an amp and more like the music that's coming out of it than before. Do be aware of this, if you are planning on hooking this baby up to full range dynamic planers, then you may want to hold off until you can afford a more powerfull amp. The Magnepan's I had when mated to the BC22 just sucked the power right out of it, but only when the SPL's started betting up there. Don't get me wrong, the BC did fine with low to moderate volume and only until it was pushed did it lose steam drasticaly. I am confident that this amp will meet every need of the person needing moderate power and who is concerned with a musical presentation, and not with exaggeration of characteristics and information within the music. Are there alot of great amps out there in the $2000.00 price range? Absolutely. It just so happens that this is the one for me. (Until I have enough money for the BC26 that is.) Highly recommended. I don't like binding posts themselves, but I do like how they are positioned; far apart to accomodate large cables. I guess I can agree with all the earlier positive comments. I am also at least the third person who switched from a Conrad Johnson MF Amplifier and will not go back. The CJ Amps are very good; I had the old series as did the earlier reviewers. Mine was a MF2100. I do not know how this would compare with the current generation CJ solid state amps. 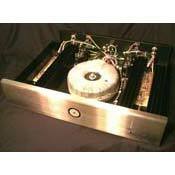 This has been compared with the Bryston 3B-ST. The Bryston being more precisely accurate and detailed, which may or may not be your taste in an amp. I am very pleased with my purchase. The sound of the BC-22 is very inviting. It pulls you into the music. The big, full, robust sound of the amp leads me to believe that the 125w rating is on the conservative side. I'm sure that there are amps out there that may give you the last word in detail or even a more transparent soundstage, but at what cost. This is a wonderful sounding amp that needs to be on your short list to audition. The McCormack DNA-125 is also very good, and was a final candidate. The Blue Circle BC-22 seemed to have life, and convey emotion. This amp replaced the CJ MF2300, and I have not regretted my decision one minute. So, if you are looking for a very well built, great sounding, reasonably priced amp, here it is! A responsible reviewer would keep an amp in his system for at least a month or so before offering a rigorous critique but I only had the amp for 3 weeks before having to send it on to a "official reviewer." And besides, I am a serious believer in the usefulness of first impressions, so here goes. around 8 feet at the other. Wood floor over cement slab. have in spades: there-ness, is-ness. The music in the room. In comparison with its stablemates, the BC 2's ($6300) and 2.1's ($9800), the amps that have come to define the norm for me (I have not heard the BC 6 at $3700), the BC 22 lacks a degree of touch, refinement, and delicacy, attributes that matter a great deal to me. And the monoblocks take away what we like to call 'the last veil' that stands between us and where we want to go - as they should! But the approach is recognizably the same: music (meaning musicians and their instruments) first. premium on presence and palpability, the Bryston on power and resolution. But if this is your price point, this is the comparison to make. "character" and a point of view to win and maintain wide acceptance. With Bryston, Blue Circle, Naim, and the others we can all name, once you've heard the designer's sound, you know where you are and what to expect. And you know whether that's where you want to be. I found out a year or so ago that Gilbert Yeung has my number. Again, I want to feel the presence of the musicians and their instruments, above all. which won't be here until later this summer. The BC 3 is definitely a factor in what I'm hearing from the BC 22.
pair, and need the 125 watts the 22 provides, this is definitely where I'd start. I am uncomfortable rating equipment because the AR rating system doesn't really allow for price points - and the value rating doesn't quite get at that either. If the Blue Circle BC 6, BC 2's, and BC 2.1's are 5 stars, which they clearly are, what is a BC 22 that gets a great deal of their sound for a fraction of the cost? I don't believe in grade inflation but I do believe in proportion. In the $2000-4000 price class, for solid state amps putting out 100-125 watts, the BC 22 is a five. Okay? Natural competition is Bryston 3B ST, which I have not heard. Plinius SA 50III, 100 III, Krell KAV 300, etc. Wow...This is the first solid state amp from a company specializing in exotic tube gear. The result? Probably the best sounding amp in its class.The fit and finish is first rate. Only premium parts are used. No plastic nuts on this beauty. The rear apron is intelligently designed. Lots of room for large cables. But what sets Blue Circle products apart from the others,is that even the president of the company, Mr. Gilbert Yeung, will field your questions and assist you if you have specialized requirements. This is not my first purchase from this company and it won't be the last.These guys are world class and first rate.